Here I am, sitting at my desk, about to go properly deep into my inboxes. While I worked a little bit every day that we were away in Lake Louise it wasn’t enough to stop the inbox glacier from creeping ever larger, and today I’ve made coffee, set everything to “ignore” (including the house, which looks like a stampede of bison went through) and put my phone in a drawer. Me and this inbox are going to tango till one of us drops, and it’s not going to be me. Before that particular dance starts though, a quick waltz with you lot. I keep saying to myself that I’ll blog as soon as I’m done with (insert absolutely unfinishable task here) so today I’m reversing it. You first, then once more into the breach, dear friends. 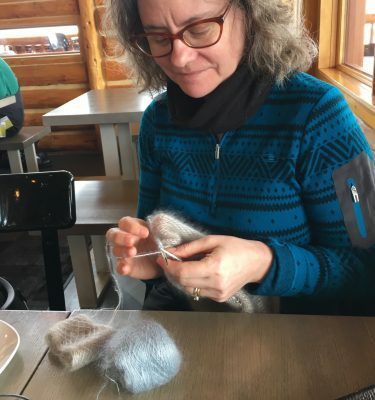 When last we saw our heroine, she was sitting in a hotel room, tapping out a blog post surrounded by skis and mohair, a combination that isn’t nearly as odd as it sounds, despite the infrequency of the mix. My complete inability to demonstrate any sort of monogamy to a knitting project continues unabated, and so I’d taken five (5) projects with us for a seven (7) day holiday. Just think about that for a minute. That means I thought I’d finish almost a project a day, while skiing six hours a day. I took two pairs of socks, a sweater (adult, only half way through the front) a cowl and a shawl. (The shawl and sweater never even made it out of the suitcase.) 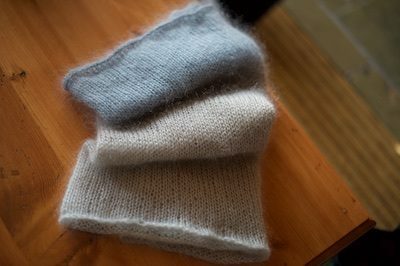 Both pairs of socks saw active duty (still in progress please stand by) and the cowl sort of turned into two cowls and I finished one on the flight on the way there, and almost the other. Yarn: Canon Hand Dyes, Ombre Cowl Kit in Agatha Lace (70% mohair, 30% silk) Pattern, Ombre Cowl Hood. Other than the part where I left a muppet’s worth of mohair fuzz everywhere I went, I loved making that cowl so much that the minute I finished (and despite having another two projects with me on the plane) I started another smaller one with the leftovers from the first one. It won’t be as big as the first, but still a proper cowl, I think. Upon reflection, it was this knitting/skiing combination that made it possible for me to finish any knitting at all, and I feel sure that if I cared less about the well-being of my husband, and worried less about the catastrophic consequences of him taking a spill down a mountain with Signature stiletto needles in his pocket, I probably could have finished the socks too. “Monogamy to a knitting project”… I love it! You just made me snort! Monogamy to a knitting project, my sister is the only knitter I know that can do that! And Joe – I hope you realize you are indeed a lucky (and loved) man! I think you planned well from a knitting standpoint. I mean, you were going skiing, you had to prepared for the unlikely but possible broken leg or similar injury that would prevent you from skiing for days but leave you with a significant amount of knitting time. Had you not brought it, who knows what would have happened… Good luck with the inbox!! I love how I always learn something from you. “Analepsis” is my new favourite word. Um, what does it mean? It means going back and narrating an event at a later part of a story than when it originally happened. Is this the point when I ‘fess up that I’m off to a Literature teachers’ conference today? 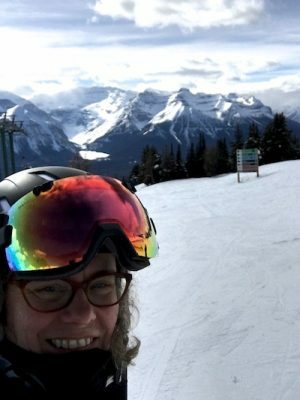 (For the record, I can’t ski to save my life, so Steph, I’m super impressed, as usual, that you have both the literary knowledge and the physical skills needed in this post. True genius! Thanks for teaching me a new word today! I love that you had such a perfect time in the midst of SO much planning and traveling. Many of us from March SA are having convos about still missing it – it is SO. GOOD. – and I am surely not the only person profoundly thankful you’ve gone to such considerable lengths to create that remarkable retreat. Agreed, Heidi! The retreat was inspiring and rejuvenating for me — all the things a retreat should be. I wish it were possible to spend more of my life in that cocoon. The cowl looks lovely, but how is Joe going to carry your knitting when you two go surfing? Good luck vanquishing the bison — dust or otherwise. My fave niece cracked up when I enlightened her as to the existence of dust bison. With a husband, three boys and a Labrador retriever, she and the robo-vac find themselves warding off the dust bison herds constantly. And it’s not even mud season yet. So happy to read your post! You always make my day better. I am a monogamous knitter. One at a time. That way I can have my wins come easily to me. Although, I will admit, I strayed a bit when I was working on very large blankets for 3 winters running. 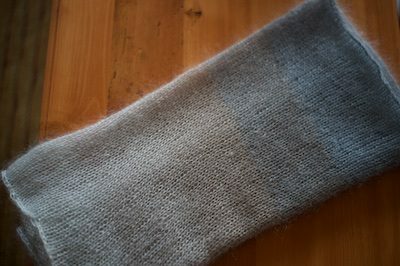 I needed socks to save my sanity from endless stockinette. How many of us have read this post and immediately Googled “analepsis”? I certainly did! It’s not nearly as awful a thing as it sounds, haha. Tell Joe that I would pay money for a photo of you knitting on a ski lift. Never mind money. Pledge a donation to the Rally for the photo. Too bad we don’t have negatives anymore, or you could offer bonus money for the negative. Maybe bonus money for an 81/2 by 11 print, suitable for framing? You have the best sense of humor!! I love to read your posts! I wish I had half the skill knitting as you do…since I am primarily a quilter, I doubt I ever will. You do inspire me though! 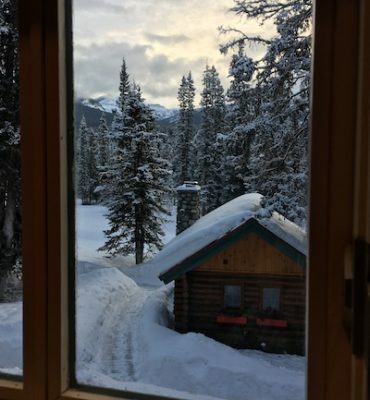 That picture looking through the window at a cabin in the snow? I swear that was in a storybook I had as a child. It can’t possibly be real. You talk about packing that many projects for a week as if it is abnormal or something. I thought everyone did! Seriously, the only time I packed one project, one of a set of four double-pointed needles snapped (in the middle of the ball of yarn…and my husband got sick. Absolutely snorted aloud at your musings! I was immediately curious about the “in his pocket” and the possibility of falling spectacularly while skiing–glad you have at least some of that covered!! Did you have the cowl needles in some sort of protectors to prevent “falling while skiing” injuries???? Double Black Diamond… was Joe skiing down that madness or just posing? 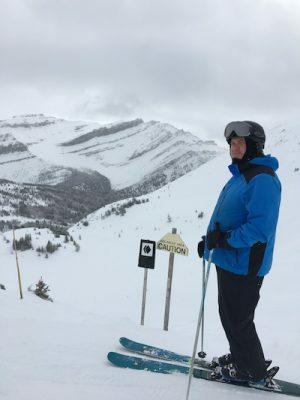 And, if he was skiing it, were you joining him? Yikes! Joe actually skied it. I went down the easier run next to it. No way I was going on that! 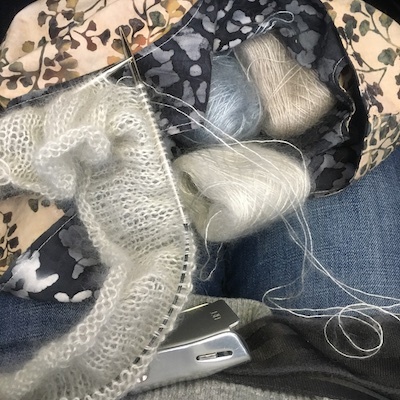 I can certainly understand the over-packing with projects thing–the last time I was at a conference I had with me three knitting projects, three books, three magazines and a work-in-progress novel. This was for a five day trip to a WRITERS CONFERENCE! I came home with an additional 20 books collected (free!) at said conference and just one completed sock. Oh, and so many new friends. Bit of a hangover, too. So, do your packing thing. But DO NOT let anyone carry Signature sock needles on their person. Using my lovely set on a current project–so lovely, so sharp! You packed the correct amount of knitting, I don’t know what you’re talking about. And that blunt needles/mohair combo is excellent! I take knitting when I backpack and I brought a purple mohair cowl last year, since it’s a lot of easy knitting in just 3oz of weight! Here’s to combining knitting and outdoor sports! Oh Lord! Signature Stilettos DPNS !!! That is a fear of mine too. I am so careful when I use those needles and put them aside carefully after counting each needle. I know once I reach 5 I have them all and put the wip in its own project bag. There is nothing like mohair when the temperatures are low with snow on the ground. I’m not entirely convinced that I wouldn’t have taken more projects than you did — I always tend to overpack on the knitting! But as we knitters know well, it’s much better to have knitting that you don’t touch than to run out. Beautiful pictures! My husband took me to Lake Louise many years ago and I cried tears of joy when he opened the drapes in our room to reveal the turquoise blue waters of the lake, as still as a mirror, reflecting the glacier and surrounding beauty of the trees. It would indeed be tragic if Joe fell and BROKE A NEEDLE! I love watching you knit with beautiful yarn. I come from a family with skin so sensitive that almost everything makes them itch. Heck, I am currently knitting acrylic socks for my son who loves my socks, but refuses to wear wool. There are no words, but the picture in my mind of Joe crashing with sock project and Signature dps will carry me through the day. Plus the thought of losing those needles in the snow and having to replace them? Everyone’s burying the lede — BLOG COME FIRST!!! (Probably just better people than I — but as a bottom-feeder, I’m all for shouldering us to the top of the guilt-heap.) I agree about the inspirational, though — I am off to the AWP conference next week (and if 13,000 writers suddenly landing doesn’t trigger the Cascadia Subduction I think we’re safe for a bit) and was set to take one (1) knitting project. Crisis averted — off to wind yarn/cast on. Monogamy is for marriages. Lots of knitting stores in Portland, Rams! But please don’t trigger the Cascadia, I haven’t finished my tax prep yet. Well, that seems like a reasonable number of projects to me. You need to give your hands and mind some respite with variation in those minute motions. The sweater might have been a bit much, though. That cowl is beautiful! and the mohair so lovely – alternating colors to get the ombre effect? Yes, I’ll go look it up. 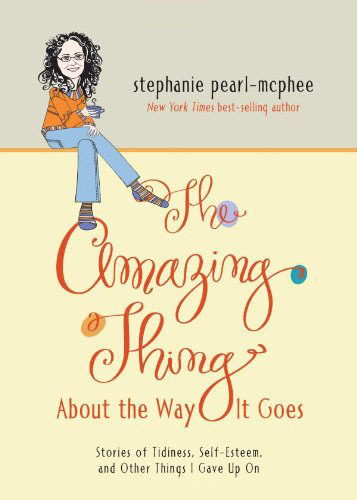 It’s a happy day when I see a new blog post here! So many knitting projects need to accompany on trips that I almost (!) need to pack another bag. Sounds like a perfect holiday. Thank you for not endangering your mate. Love the look of that mohair! I am casting one on next – mine will be burgundy to pale pink. Too delicious. Your first set of “river needles” will probably last for decades. If, however, you took better needles, you would probably lose one on the first day. Thanks for making us a priority! “A muppet’s worth of mohair” – the best description ever! I can’t believe I never considered bringing knitting onto ski lifts. I didn’t think skiing was an activity that could be improved, but that would do it. Thinking ruefully of all the lost knitting opportunity over the years… And weighing it against the possibility that my knitting needles (I like ’em sharp) would puncture my CamelBak. A sodden ski jacket would really put the damper on things. I might have to resort to needle protectors. Oh how I wish I were a monogamous Knitter. I go through phases of trying to reduce the amount of WIP’s I have. They rarely last long and certainly not long enough to be of value.